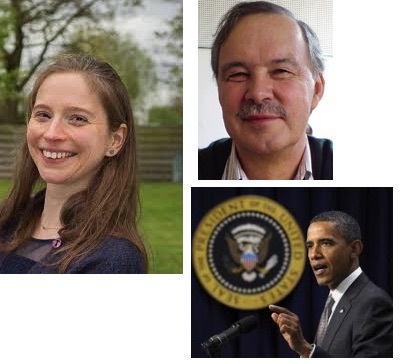 Today’s seminar (5/2) will feature LEL’s own Tine Breban and John Payne, as well as a guest appearance from Barack Obama, although only as a proper name modifier. The talk will take place in A113, and it will start at 4.15 as usual. Everyone is welcome to join for drinks and dinner afterwards. Abstract below. In this paper we investigate the role of semantic relations in the grammatical alternation between the proper name modifier construction, e.g. the Obama government, and the determiner genitive, e.g. Obama’s government. Rosenbach (2007) suggested that these constructions can in principle alternate, but that the alternation is constrained by semantics in so far as proper name modifiers can express a wider range of semantic relations than determiner genitives. To date, however, Rosenbach’s suggestions remain untested empirically. Through the use of an experimental study in which participants were asked to rate the naturalness of the two constructions in 20 attested natural language contexts and provide paraphrases of the semantic relations in question, we tested when the two constructions alternate and whether either construction expresses semantic relations that block alternation. Our main finding is that none of the relations we studied is categorically associated with only one of the constructions but that certain relations – notably possession and name – are far more preferentially associated with determiner genitives and proper noun modifiers respectively. Despite these “default” associations, participants nevertheless identified a range of possible interpretations for many of the examples, a result which points towards the semantic underspecification of both constructions. More generally, our study shows the value of an experimental approach as a corrective to researcher intuitions about the identification of semantic relations in context.